On Saturday 23rd June 33 Crossover clubbers completed a sponsored hike from Ashridge monument to Haven House in Hemel. Everyone came dressed as some kind of super hero and the walk took five and a half hours to complete (Superman decided to walk). The evening was spent eating pizza and watching Spiderman 2. Well done to all who took part in the hike, great fun was had by all. We managed to raise well over £300 and still counting. I thought it was great to see so many young people involved. It was good to know that we have so much support for what we are going to be doing in Bolivia. Good luck in you travels. Send us lots of pictures. Thanx soooo much for all your love & support thru my years with Crossover, I’m gonna miss you both more than you know! But I’m trusting in the Love from Above, as Im sure you guys are too. Go, give, grow!!! Hiii hope you both have a great time in bolivia will miss you loadsss! 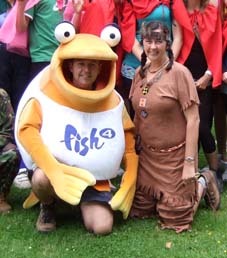 you looks good in fish outfit dean!